The Leeds Model Company, founded by Rex Stedman in 1912, was after Hornby and Bassett-Lowke the third largest model railway manufacturer in the UK in the years between World Wars 1 and 2. From modest beginnings the company grew rapidly after 1919, and with finance from G.P.Keen, moved from custom building into mass production of a first series of standardised scale model tank locomotives. The iconic 0-4-0ST was also introduced at this time, along with other enduring models, the ex GC 4-4-0 ‘Butler Henderson’, and 4-6-0 ‘Sir Sam Fay’. Two locomotives, a Great Western Churchward 4-4-0 County and Pickersgill Class 72 Caledonian 4-4-0 were produced for Bassett Lowke in 1922. 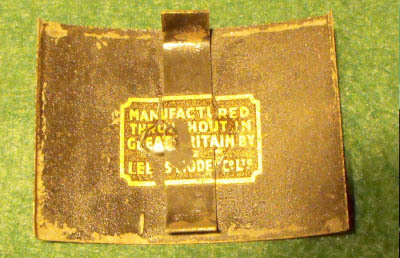 The parts and tooling for these were later used to manufacture the LMC GW Mogul and the Pickersgill 0-6-0 goods locomotives. Other models supplied at this time were an LMS Claughton, an LNER (Ex GN) Atlantic, LNER 4-6-2 classes A1 and A2, and a Urie 4-6-2T. Early in 1920 and to reduce production costs, and whilst continuing to supply hand built wooden stock, Stedman developed a pre-grouping range of wagons and coaches using high quality paper lithographs on standardised timber bodies. Probably, the most popular and enduring of the LMC models are the second series of standardised tank locomotives introduced in 1935. These six quite distinct models, of which the most commonly seen today are the LMS (Ex L&Y) 2-4-2T and the LNER (Ex GC) 0-6-2T, were economically engineered to come from a single set of tooling and dies. Moulded Bakelite coaches, wagons and vans were introduced in the late 1930’s and were an immediate success. The post WW2 years were difficult for all model companies, no less, with its focus on ‘0’ Gauge, for the LMC. Nevertheless the company moved boldly to introduce several new locomotives including standard 4-4-0 tender locos and a seventh series 2 standard tank configured as a short 0-6-0. The models were designed for maximum cost reduction without undue sacrifice of realistic appearance. They were freely adapted to suit any of the big four companies and, later, BR prototypes. Train sets, both goods and passenger, were offered from the early 1950’s. Also from 1950, outworked locomotives, made by professional modellers, including an LMS Jubilee, GW Hawksworth County, GW 57XX Pannier and Prairie tanks, and even an LMS Princess, were also featured in the product range. These and all other ready to run locomotives ceased to be available after 1959. The product range was then more or less confined to spare parts and kits. Despite all efforts however, the company, by then trading as Ellemmsee products went into liquidation in 1967. Rex Stedman had passed away six years before. himself, who brought this remarkable piece of archive material to my notice. These show Rex Stedman as he was during the war, a test pilot for Blackburn Aircraft. Rex is at the left hand side of the group celebrating the 1000th repair aircraft out of Sherburn-in-Elmet where Rex was based. 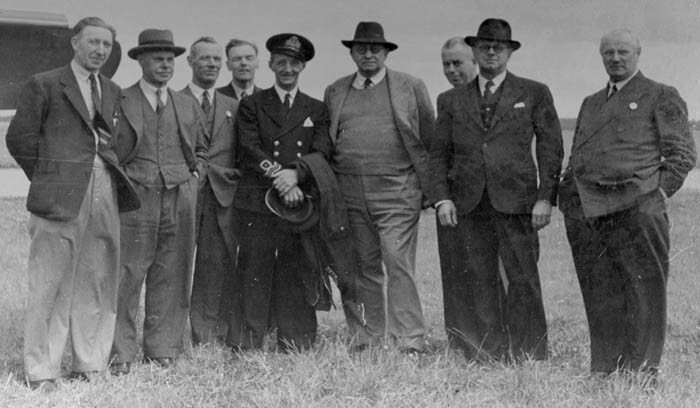 In the second picture Rex, (with flying helmet) with a group of engineers is about to test fly a Blackburn Botha, (an aircraft with a bad reputation for fatal accidents). Fortunately on this occasion all went well!" After a 25,000 mile journey and over 6 months in the Leeds Stedman Trust workshops, the veteran K3 ‘Wooloomooloo’, originally shipped out to Australia with the Hordern layout in 1928 is back home! 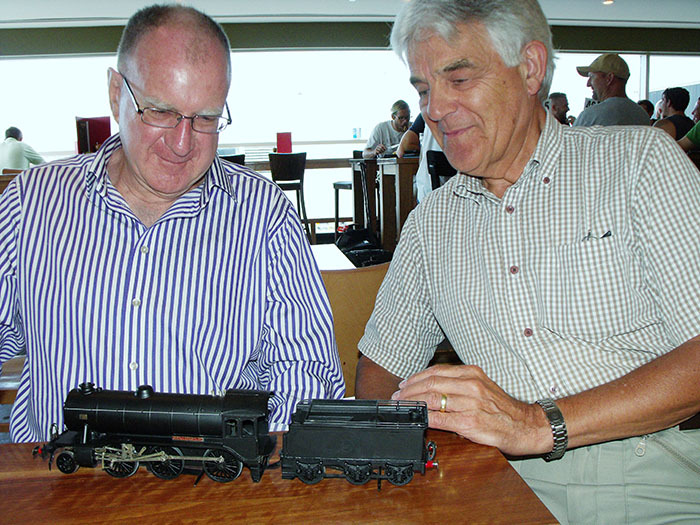 Here David Peacock, hands the loco over to Glyn Eden who continues with the restoration of the layout. With Wooloomooloo, we now have the full complement of the locomotives supplied to operate the layout. One of the two 0-4-0 saddle tanks the partner loco to ‘Milton’ is not however original. ‘Milton’ itself was restored and returned to the layout several years ago, but its original partner, if it has survived, has yet to be found. Along with the original locomotives we also have most of the original coaching stock and some of the goods vans and wagons. Gaps in the full original inventory, are gradually being filled from current purchases of original items as these come on to the market. Leeds Model Co. smoker-fitted locomotive cylinders. On the right, the intergranular cracking and swelling are clearly seen, the zinc positively bulging out of the end of the brass cylinder. 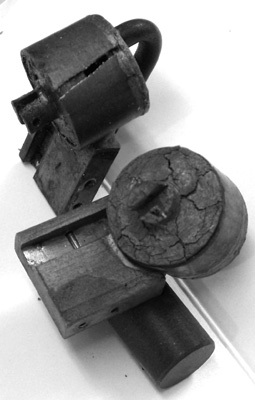 On the left the piston was completely within the cylinder when disintegration began. The force of the expansion - largely caused by hydrogen, which is one product of the corrosion reaction, is sufficient to split the brass cylinder from top to base. In most cases the damage can be repaired and an aluminium piston fitted thus restoring the function of the smoker unit 'puffer'. The LMC 0-4-0 saddle tank (the Donkey) was one of the longest lived models in the Company range, in production from 1920 to the mid 1950s. In that time there were more than a few changes to the model, but here is one I have never previously seen. 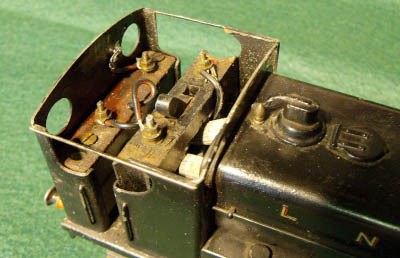 The roof on a smoker fitted model attached by clips, with wires soldered to the cab sides to support the roof edges. The usual format has the roof sliding into folded guide bars, so how many Donkeys were made like the one seen here? There is little doubt this is an original item, the transfer if poorly applied over the clip is the witness to this. Over the years we have had many of the Leeds 0-4-0 saddle tanks - the donkeys - pass through our hands. Here however is a variant never seen before. 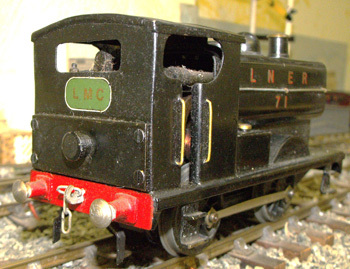 The bold ‘LMC’ transfer suggests that it may have been a works modification but…? The smoker oil tank is fitted firmly to the rear of the cab by the four screws visible in the picture. The tank is filled with oil via the screw plug. The on/off switch is set firmly into the top of the smoker unit and is accessed through the enlarged single rear window. The whole job is neatly done. The cab roof, which does not need to be removed, is integral with the body and has two ridges. So is this a customer or a works modification? Has anyone else seen the like elsewhere? 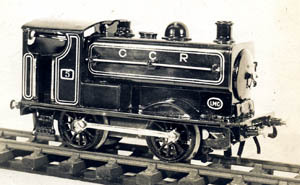 Rex Stedman built only two models of the LNER K 3 2-6-0 locomotives. One was for Frederick Rush, the other went to Australia with the Hordern layout. Today the Hordern loco, rescued by chance from a junk shop, is restored and back in Australia. The other K3 had an even luckier escape, before it ended up in the Trust archive. I am indebted to Bill Truin for bringing an article in the Model Railway News (1953) to my attention. In it, Frederick Rush writes of his 0 gauge LNER models and in particular mentions the K3, which he had last illustrated in the magazine in 1937. He writes, “ This model was the only one of my pre-war stock to survive the Bristol blitzes and, as a reward, has been provided with a chimney more like that of the prototype than was the original; it is still clockwork, but is scheduled to be rebuilt and fitted with an electric mechanism and fine scale wheels as soon as time permits. The loco was certainly re-motored with a Bonds mechanism, but kept its standard scale wheels. It is now skated for stud contact and operated regularly for visitors to the Trust layout. A lucky escape indeed, and perhaps the small dent on the boiler is after all due to bomb damage, not careless handling!